The Real People are Liverpool’s great lost band and its finest sons. The natural successors to the LA's and a huge influence on Oasis with an unparalleled back book of brilliantly written songs performed to perfection live. Soldier complete a stellar line up with their melodic stadium-esque anthems & dirty grooves. 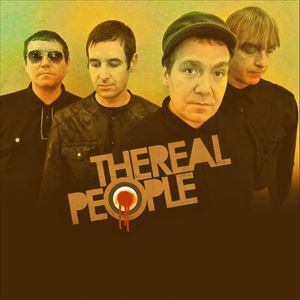 Iconic Liverpool band The Real People return to Birmingham having smashed The Flapper with a sold out gig in October. The Realies are a bucket list band that have to be seen live to be fully appreciated, a genuine force of nature. Expect a selection of career classics such as Rayners Lane, Window Pane, Dream On, People In The Telly etc. from their huge body of work. The band who were a "massive influence" on Oasis (notably Columbia and Rocking Chair) and OCS, a fact belatedly acknowledge by Alan McGee ("one of only three bands he regrets not signing, along with the La's and The Stone Roses") and Liam Gallagher who has tweeted of his love for the Realies extensively. Much loved by their peers and contemporaries to the extent that OCS walked on the stage at Brixton Academy carrying a Real People flag. Support comes from The Train Set with a classic sound informed by The Bunnymen, Smiths and the whole 80s Manchester / Liverpool vibe (check out She's Gone) and local favourites Soldier with their melodic anthems. Do not miss this gig !!!! !